Krystal Ramirez, a multidisciplinary artist, combining multiple disciplines in one activity, who works primarily in textiles, is the newest Artist in Residence at Juhl in Downtown Las Vegas, and we couldn’t be happier to have her! The Artist in Residence initiative, the brainchild of Uri Vaknin, whose company has a significant investment in the area as owner of both The Ogden and Juhl, believes that art is foundational to building a community. So two years ago, he invited working Nevada artists to apply for the program which is designed to nurture up-and-coming artists, provide connection to nearby 18b Arts District, and help to brand and promote Juhl as a place where creativity is welcomed. Residency includes the opportunity to live and work rent-free at Juhl for up to six months. This includes a two-level live/work space at Juhl with a ground-level studio space of approximately 1,000 square feet and approximately 1,000 square feet of living space on the second floor. Justin Favela, a sculptural artist in Las Vegas, was the inaugural Artist in Residence who used live/work space to work on a commissioned piece for the Mi Tierra: Contemporary Artists Explore Place exhibit at Denver Art Museum. He was one of only 12 other Latino artists from across the country to participate in the prestigious show. Selected by a jury for the Residency, Krystal is a first-generation daughter of Mexican immigrants. Her work reflects on justice and visibility and is inspired by her upbringing, while offering an intimate look into the anxiety, expression, and communication rooted in her Chicana identity. “As a female, up-and-coming artist and person of color, I’ve felt the responsibility to elevate my voice while engaging different socio-political issues that affect and marginalize communities,” said Krystal. Her dad, a stickler for handwriting and spelling, played a major role in developing her pursuit for perfection, which over the years has influenced her passion and skill in art and photography. She graduated from UNLV in 2009 with a Bachelor of Fine Arts in Art and went on to work as a commercial photographer, capturing events such as Life is Beautiful as well as portraits of casino executives and celebrity chef portraits. Historically, she was adamant about not mixing her photography with her art, but says her residency at Juhl has inspired her to print some of her photos, which she hasn’t done since college. 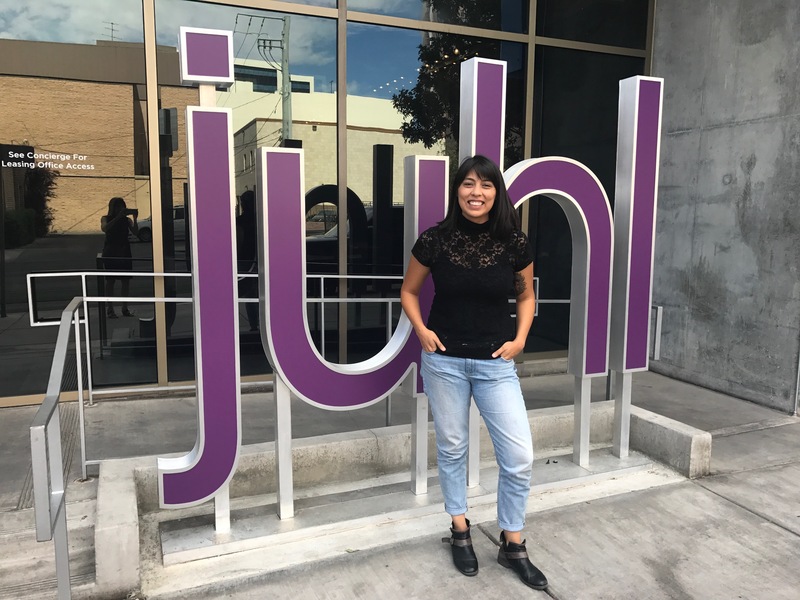 “Living and working at Juhl in the heart of Downtown Las Vegas provides me with a community of diverse and creative individuals and is a compelling environment to advance my artistic, socially-focused vision,” she said. Krystal was one of 30 new artists who submitted an application for Juhl’s residency. Her first big project is to recreate her 12-by-15-foot piece “I Want to See,” previously displayed at the Clark County Government Center. The giant banner, made with Bible paper, features handwriting and is sewn together with thread. She is also hoping to create a large crochet piece in her studio.